This product is not approved for use in humans. Sentinel for Dogs & Puppies does not kill adult fleas, but contains lufenuron which inhibits the development of flea eggs to break the flea life cycle. Sentinel pet meds are given once a month to dogs for heartworm prevention and flea control. Sentinel also removes and controls adult roundworm and whipworm infections. SENTINEL Flavor Tabs are available in four tablet sizes in color-coded packages for oral administration to dogs and puppies according to their weight. (. Each tablet is formulated to provide a minimum of 0.23 mg/pound (0.5 mg/kg) of milbemycin oxime and 4.55 mg/pound (10 mg/kg) body weight of lufenuron. 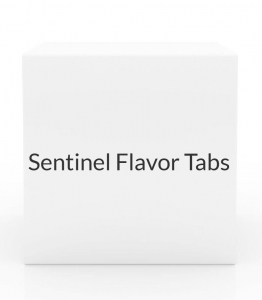 SENTINEL Flavor Tabs must be administered monthly, preferably on the same date each month. Treatment with SENTINEL Flavor Tabs may begin at any time of year. In geographic areas where mosquitoes and fleas are seasonal, the treatment schedule should begin one month prior to the expected onset and should continue until the end of “mosquito and flea season.” In areas with year-round infestations, treatment should continue through the entire year without interruption.